The pitch sailed over Perla Vick’s head and smacked into the chain-link fence surrounding the bullpen. The catcher eyed her pitcher, then glanced at her coach. But truth is, everyone on the softball team at Southeast High School was a little bit nervous Tuesday. How could they not be? They had a home opener that was more like a grand opening. There were food tents and alumni introductions and even pregame roses for the players. And yes, there were all sorts of folks taking pictures. Then again, it’s not every day that you play for the first time on one of the finest fields in the metro. “It is beautiful,” Vick said. Southeast softball is the latest renovation completed by Fields & Futures. The non-profit’s mission is to remake every athletic field in the Oklahoma City Public Schools, both at the middle and high school levels. Twenty-two fields have been done in five-plus years. Nineteen remain. Being at Southeast on Tuesday afternoon told you why Fields & Futures soldiers on. Alums returned to be part of the event. Students turned out. Parents cheered on. Even the school district’s new superintendent came out to show his support. But really, you didn’t have to look any further than the faces of the players to see why these renovations are worth every penny. Southeast has produced some of the greatest bat-and-ball athletes that Oklahoma has ever seen. During a decade-long stretch starting in the mid-1960s, three baseball players from the school became not only big-league ballplayers but also All-Stars. Bobby Murcer. Darrell Porter. Mickey Tettleton. But when Southeast closed for several years during the 1990s, the field where those men once played became unrecognizable, overgrown and neglected. The school re-opened in 1994, but the baseball and softball fields were never restored to their previous luster. Tom Trammell, a longtime teacher at Southeast who is now retired, had his classroom on the far west side of the building. He could walk out his door and be only steps from the softball field. Too often what he saw looked more like a water feature than a softball field. “It didn’t have to rain very much to swamp it,” Trammell said. Because the surrounding land was a bit higher, a rain shower could leave the field unplayable for a day or two. And a strong Oklahoma thunderstorm? That might force the softball team to look for higher ground for a week or more. The team regularly had to reschedule home games at opponent’s fields because it simply couldn’t use the field. “It was called Lake Southeast,” Vick said. It was funny — but then again, it wasn’t. Mylissa Hall wanted better for her students. 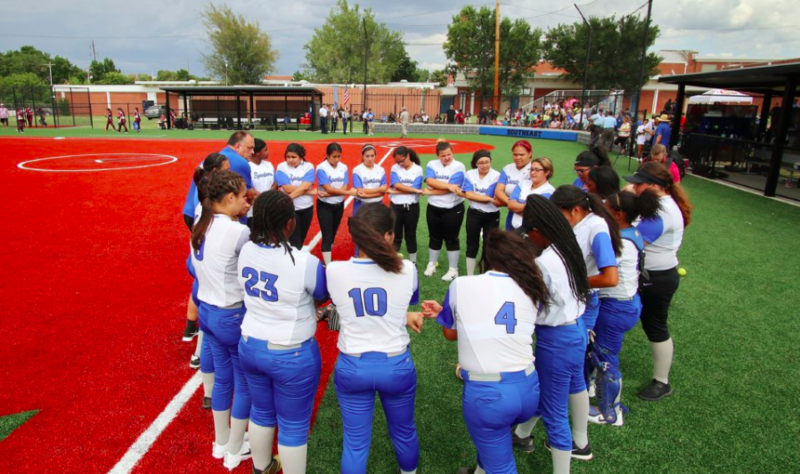 As a Southeast alum and the school’s principal, she longed for the day that the softball and baseball fields could be fixed because she knew the power of transformed fields. Living near Webster Middle School, Hall saw how Fields & Futures overhauled the fields there a few years ago. There weren’t really fields to speak of at the school east of Will Rogers World Airport. It simply had an open and often overgrown lot. Now, the school has fields that are defined and pristine and a magnet for the surrounding community. “You’re going to come to Southeast and do that?” Hall asked the Fields & Futures reps when they approached her with their plans a year or so ago. Southeast got an all-turf softball field and a baseball field with an all-turf infield. It will allow for more use and nearly year-round play. “Now, we’ve got football players saying, ‘When is that going to happen for us?’” Hall said. The emotions were similarly strong Tuesday afternoon. Even though the players have been practicing on the field for weeks, this was different. There was an opponent, Capitol Hill, in the other dugout. There were fans packing the bleachers and scattered around in lawn chairs. All that made for nerves and jitters and butterflies. It made for fun, too. Serra Stoliby, the pitcher who was sailing her stuff in pregame, settled down and got through the opening half inning without allowing a run. Then in Southeast’s half of the first inning, Stoliby recorded the first hit on the new field. An inside the park home run. Southeast rolled through the game, winning by run rule, 11-0, in four innings. But there was little time for celebrating; Southeast and Capitol Hill had a junior varsity game to play. A year ago, Southeast hardly had enough players for the varsity squad. This year, the numbers have nearly doubled. Southeast now has a softball field to be proud of — and to be played on.